If I were a wolf would Jags still be alive? No. R_R I would never eat you. Well, great Job. Not a werewolf. Never was one in any games. The pokemon threw a large rock at Alakazam and he died. Then Kingler, Vespiquen, and the narrator had homosexual relations in a hilarious inside joke they had with Alakazam, which has absolutely nothing to do with the plot of this mystery. BEGIN DAY TWO - NIGHT PHASE. If you have a power that can be used at night, you are allowed to do so now. Also, the Mason King has received a new power - the ability to discover who the Seer and Wolf Shaman decide to use their power on. The pokemon awoke to find the blood-and-gutsy remains of a dead Pidgeot. 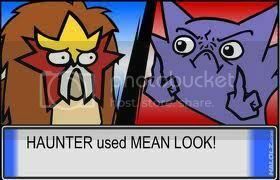 Everyone rejoiced because Pidgeot was a douche though, so no one really cared. BEGIN DAY THREE - DAY PHASE. If you have a power that can be used at day, you are allowed to do so now. I'm convinced Afonso is one of the werewolves. I can't be bothered to look through the list and see who's who, and Afonso was a wolf last game, so thats good enough for me. Hopefully the numbers will thin out soon and I will be able to stop using the random calculator to chose my vote! Don't take any offence, just a random vote. I could see Krisp or Serpentsounds or Rhapsody doing this. They might of killed off R_R to throw people off their trail. Patchy could be involved as well. For real. I highly suggest you attempt to lynch these people, starting with Serpentsounds. Nah, I just needed somebody to vote for too. The random thoeries that make no sense at all and are probably wrong have returned! I could see Krisp or Serpentsounds or Rhapsody doing this. They might of killed off R_R to throw people off their trail. Patchy could be involved as well. Serpentsounds or Rhapsody? Maybe. They're friends, but also very cunning and I could MAYBE see them doing that, but that's a maybe. Krisp or Patchy? No. Well, yay for random theories, as they're the lifeblood of Werewolf! No point in including others in the random vote (unless you want it to drag on? ), so of those mentioned, pikachu wins my vote this time. Edit: Well, actually... change the to , as I think I just voted for a dead guy. Last edited by Theolithical on Sun May 17, 2009 2:22 pm, edited 1 time in total. Uh, so even though feraligatr and pikachu had the same amount of votes, Feraligatr died because he didn't vote. Mysteriously. :O! IT COULD HAPPEN TO YOU TOO! IF THE ROUND HASN'T STARTED YET, DONT VOTE. IT'S NOT THAT DIFFICULT TO UNDERSTAND. Later that evening the pokemon discovered Noctowl at the bottom of one of those glowing radioactive tubs of acid that the supervillan always falls into while shouting "NOOOOOOOOO!!!" 8. YOU ARE NOT ALLOWED TO SHARE ANY CONVERSATIONS YOU'VE HAD WITH THE HOST. THIS INCLUDES ROLE PMs. Calling all you bandwagoners, this one seems to me a little #FF0000, ifyouknowwhatimean. I don't really know how one can apply strategy to this, so.. yay, continued random voting. Hooray for theory continuation of epic win! I can't be bothered to do anything better this round. I know I'm not part of the game but..
Could you tell the roles of the dead?